The role of the assistant general manager is to aid the general manager in directing, coordinating and planning the day to day operations of the business. 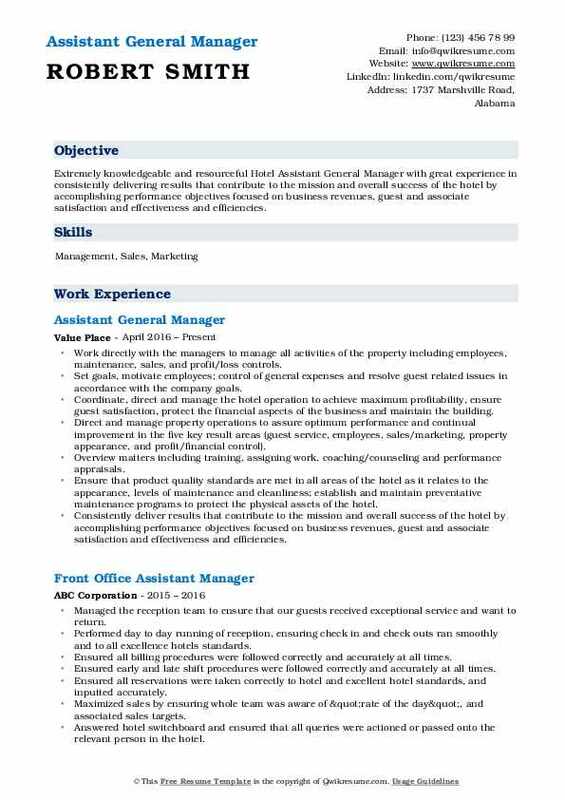 The roles commonly described in the Assistant General Manager Resume include – creating weekly schedules, ensuring smooth workflow, managing daily operations, helping with human resource activities, taking charge of administrative duties, training new employees, assisting in front and back likes if needed and also lending a helping hand in meetings and training sessions. Candidates are supposed to possess the necessary skills and qualifications to become assistants for the general manager, the following are some of the core skills expected – proven work experience, leadership and time management skills, proficiency in related software, a thorough knowledge of the company’s operations and familiarity in handling all types of equipment and tools. Most of the recruiters prefer a degree from their potential assistant general managers. Headline : To obtain a managerial assignment in a stimulating and challenging environment, building the success of the organization while I experience advancement opportunities. 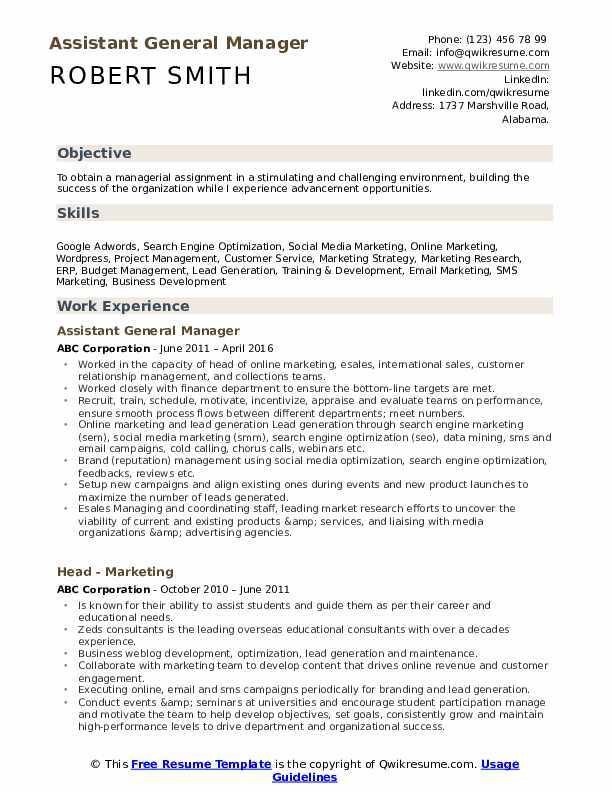 Worked in the capacity of head of online marketing, esales, international sales, customer relationship management, and collections teams. Worked closely with finance department to ensure the bottom-line targets are met. Recruit, train, schedule, motivate, incentivize, appraise and evaluate teams on performance, ensure smooth process flows between different departments; meet numbers. Online marketing and lead generation Lead generation through search engine marketing (sem), social media marketing (smm), search engine optimization (seo), data mining, sms and email campaigns, cold calling, chorus calls, webinars etc. Brand (reputation) management using social media optimization, search engine optimization, feedbacks, reviews etc. Setup new campaigns and align existing ones during events and new product launches to maximize the number of leads generated. Esales Managing and coordinating staff, leading market research efforts to uncover the viability of current and existing products & services, and liaising with media organizations & advertising agencies. Recruit, train, mentor, motivate and deliver numbers through the team. 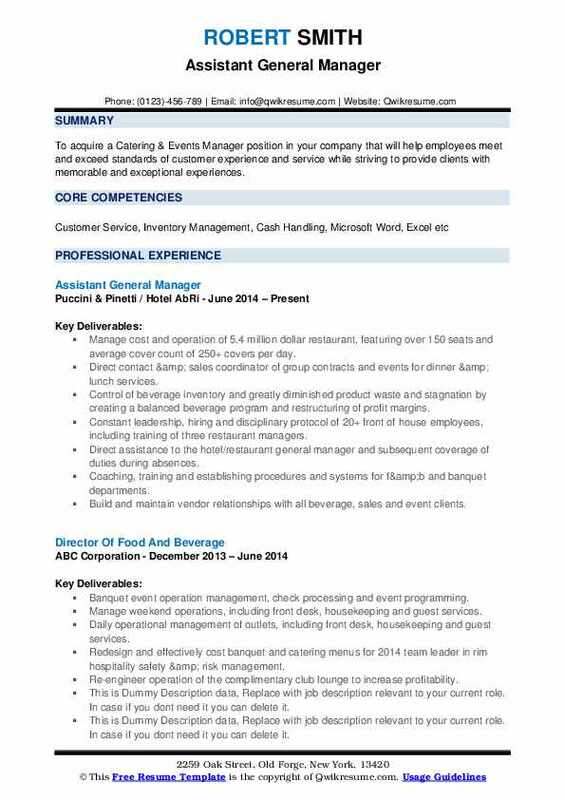 Headline : To acquire a Catering & Events Manager position in your company that will help employees meet and exceed standards of customer experience and service while striving to provide clients with memorable and exceptional experiences. Manage cost and operation of 5.4 million dollar restaurant, featuring over 150 seats and average cover count of 250+ covers per day. Direct contact & sales coordinator of group contracts and events for dinner & lunch services. Control of beverage inventory and greatly diminished product waste and stagnation by creating a balanced beverage program and restructuring of profit margins. Constant leadership, hiring and disciplinary protocol of 20+ front of house employees, including training of three restaurant managers. 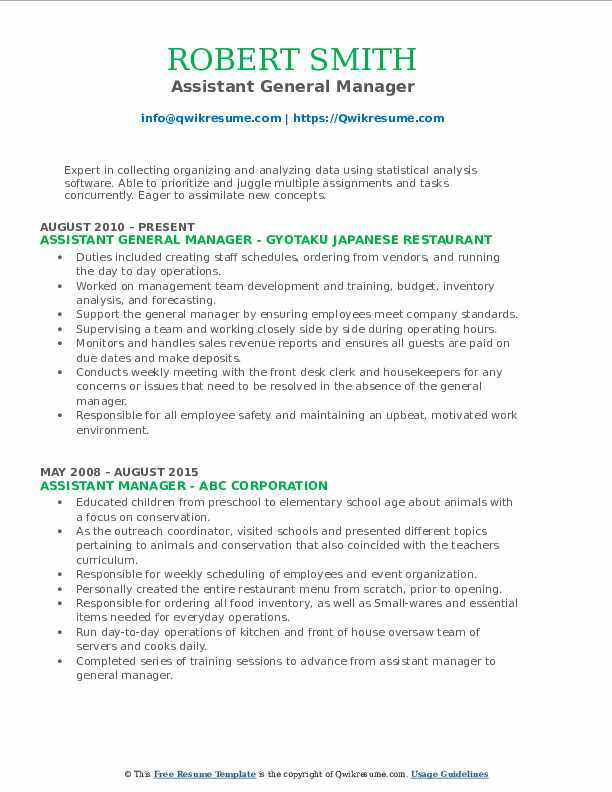 Direct assistance to the hotel/restaurant general manager and subsequent coverage of duties during absences. Coaching, training and establishing procedures and systems for f&b and banquet departments. Build and maintain vendor relationships with all beverage, sales and event clients. Consistent employee satisfaction year over year with an average of 82/100 score, achieving above the company average. Daily training and coaching of staff to adhere and adapt to company service standards. Headline : Multifaceted leader and problem-solver with over 13 years experience in operations management. Innovative and driven, with a focus on maximizing results while running a lean operation focused on client experience. 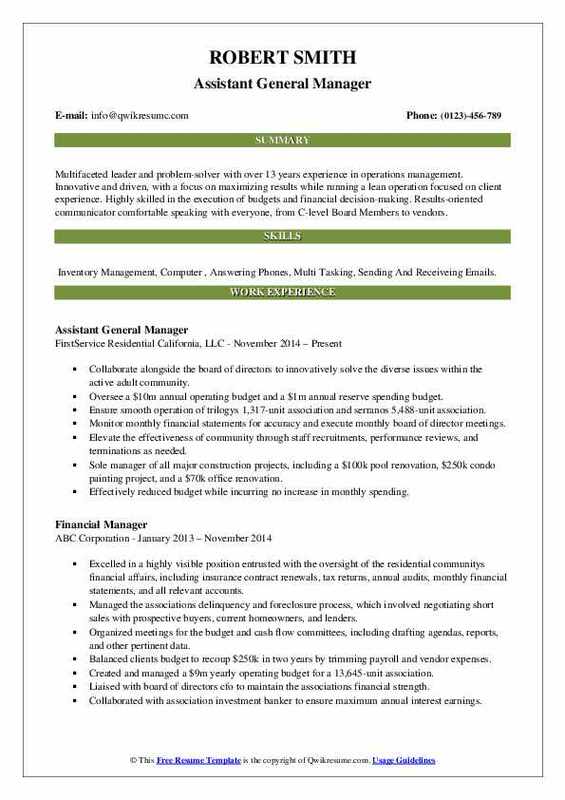 Highly skilled in the execution of budgets and financial decision-making. Results-oriented communicator comfortable speaking with everyone, from C-level Board Members to vendors. 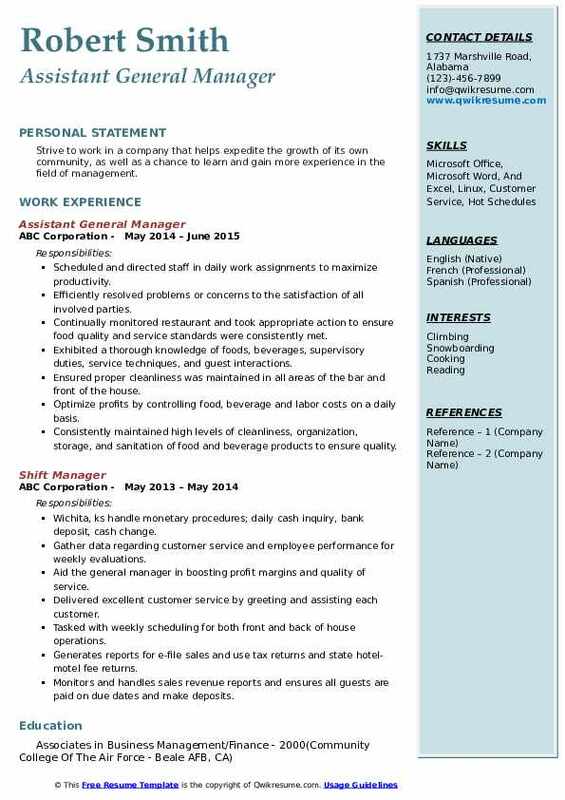 Skills : Inventory Management, Computer , Answering Phones, Multi Tasking, Sending And Receiveing Emails. Collaborate alongside the board of directors to innovatively solve the diverse issues within the active adult community. Oversee a $10m annual operating budget and a $1m annual reserve spending budget. Ensure smooth operation of trilogys 1,317-unit association and serranos 5,488-unit association. Monitor monthly financial statements for accuracy and execute monthly board of director meetings. Elevate the effectiveness of community through staff recruitments, performance reviews, and terminations as needed. Sole manager of all major construction projects, including a $100k pool renovation, $250k condo painting project, and a $70k office renovation. Effectively reduced budget while incurring no increase in monthly spending. Negotiated a five-year telecom contract which saved the association over $60k. Slashed cost of security within the community by $5k per year without sacrificing effectiveness. Summary : Hospitality professional who leads and empowers others to deliver optimum service. Adept at directing, training and developing staff. 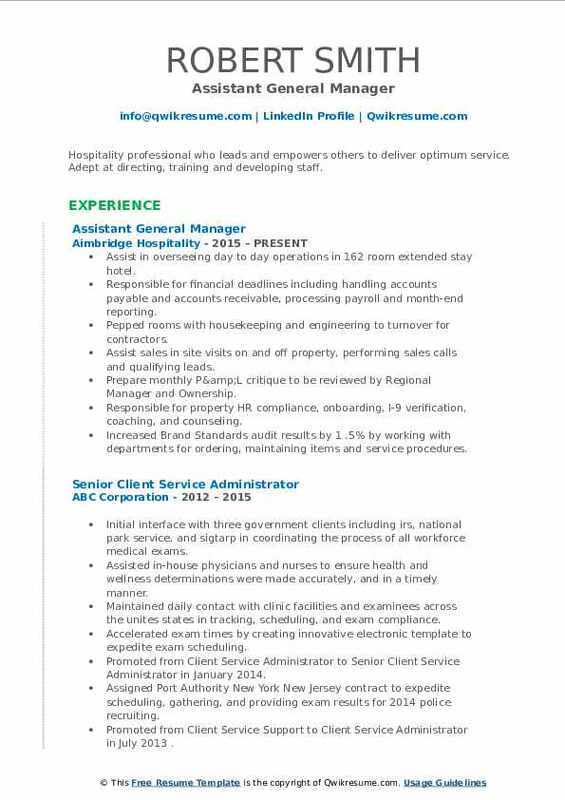 Assist in overseeing day to day operations in 162 room extended stay hotel. Responsible for financial deadlines including handling accounts payable and accounts receivable, processing payroll and month-end reporting. Pepped rooms with housekeeping and engineering to turnover for contractors. Assist sales in site visits on and off property, performing sales calls and qualifying leads. Prepare monthly P&L critique to be reviewed by Regional Manager and Ownership. Responsible for property HR compliance, onboarding, I-9 verification, coaching, and counseling. Increased Brand Standards audit results by 1 .5% by working with departments for ordering, maintaining items and service procedures. Responsible for ensuring serve safe standards are adhered to at all times. Preparing and analyzing daily reports to show product losses and track inventory needs. Objective : Strive to work in a company that helps expedite the growth of its own community, as well as a chance to learn and gain more experience in the field of management. Exhibited a thorough knowledge of foods, beverages, supervisory duties, service techniques, and guest interactions. Ensured proper cleanliness was maintained in all areas of the bar and front of the house. Optimize profits by controlling food, beverage and labor costs on a daily basis. Objective : Extremely knowledgeable and resourceful Hotel Assistant General Manager with great experience in consistently delivering results that contribute to the mission and overall success of the hotel by accomplishing performance objectives focused on business revenues, guest and associate satisfaction and effectiveness and efficiencies. Work directly with the managers to manage all activities of the property including employees, maintenance, sales, and profit/loss controls. Set goals, motivate employees; control of general expenses and resolve guest related issues in accordance with the company goals. Coordinate, direct and manage the hotel operation to achieve maximum profitability, ensure guest satisfaction, protect the financial aspects of the business and maintain the building. Direct and manage property operations to assure optimum performance and continual improvement in the five key result areas (guest service, employees, sales/marketing, property appearance, and profit/financial control). Overview matters including training, assigning work, coaching/counseling and performance appraisals. Ensure that product quality standards are met in all areas of the hotel as it relates to the appearance, levels of maintenance and cleanliness; establish and maintain preventative maintenance programs to protect the physical assets of the hotel. Consistently deliver results that contribute to the mission and overall success of the hotel by accomplishing performance objectives focused on business revenues, guest and associate satisfaction and effectiveness and efficiencies. Oversee the guest service function to ensure corrective action is taken to resolve guest complaints and ensure that superior guest service is delivered. Summary : Expert in collecting organizing and analyzing data using statistical analysis software. Able to prioritize and juggle multiple assignments and tasks concurrently. Eager to assimilate new concepts. Duties included creating staff schedules, ordering from vendors, and running the day to day operations. Worked on management team development and training, budget, inventory analysis, and forecasting. Support the general manager by ensuring employees meet company standards. Supervising a team and working closely side by side during operating hours. Monitors and handles sales revenue reports and ensures all guests are paid on due dates and make deposits. Conducts weekly meeting with the front desk clerk and housekeepers for any concerns or issues that need to be resolved in the absence of the general manager. Responsible for all employee safety and maintaining an upbeat, motivated work environment.